I teach at one of the most diverse high schools in Philadelphia. In my World History classes, I easily have over 7 - 8 languages represented out of the 28 to 32 students within the classroom. Discussing issues pertinent to Black people may not easily be received well unless you see the value and interconnectedness of the struggles for equality that all People of Color and some European peoples have had to endure. For this reason, I make sure to become as knowledgeable as possible about the backgrounds of my students so that I can not only bring them into my World History lessons, but also to show how their story is connected to the current state of their peoples in 2018. Though Black Lives Matter in Schools started this week, I've been dedicating the Do Now (students response to a prompt immediately after walking into class) portion of my classroom to famous figures of African/AfroLatino/Caribbean descent since Black History month started. This was to help build up anticipation for BLM in Schools but also to help develop my students background knowledge on Black History. To start off the month, we watched a video of Celia Cruz, the most famous Latin artist of the 20th century who not only was Cuban, but Afro-Latino/Black! Suddenly, the work I'd been doing around race and what it means to be Black with my Afro-Latino students really started to pay off. They saw a visual representation of the conversations I'd had with them play out as they watched the 4 minute video about Celia's life. One of my Dominican students' (who swore up and down he wasn't Black because he was Dominican) came to me yesterday as we were discussing Amara La Negra in advisory and showed me a video of him telling his Dominican friends they too were Black. Their comments were just like his original response when we talked about the origins of the Dominican Republic in the hallway one day before advisory began...denial. Denial, until I explained the difference between Nationality, Race, Culture, Ethnicity and how he could be a Black, Dominican, Lightskin, Latino boy living in the US. He asked me if he could film me explaining the history and connections so that he could show his friends. He had learned and now he wanted to teach. His reaction is why Black Lives Matter in Schools should be the rule not the exception. To begin the week of BLM in schools, I played the video "Letters for Black Lives" read by Asian Americans (which included people of Arab, Chinese, Indian, Japanese, Pakistani backgrounds) in class and asked my students to write what the video was about. I also asked them to write whether they agreed or disagreed with it and to explain their reasoning. The next day, we watched an interview of Maya Lin where she explains her process behind creating the Civil Rights Memorial and why she didn't know as much about the movement before creating the memorial. After studying the materials, she realized that her design would need to make people want to leave the exhibit and learn more through their own research. Furthermore, Maya explains that she chose Dr. King's famous paraphrased quote from the Bible, "We will not be satisfied until justice rolls down like waters and righteousness like a mighty stream" as inspiration and why his quote made her choose water as a unifying theme. Perhaps the most poignant words Maya said is, "this was a people's movement...the past is not done...it's not a closed timeline...it's ongoing...so I needed something to connect the past...with something to talk about the future...". When the video was done, you could hear a pin drop. My Asian American students were watching intently, partly because they saw themselves in the speaker, partly because the subject matter was put in a way for them to connect to and understand. I also began to mention Ellis Island and how it had a counterpart on the West Coast off of California, Angel Island. My usually quiet Chinese American Mandarin speaking student, finished my sentence for me and smiled and nodded as I continued on to explain the oppression of Chinese migrants being held on the island indefinitely due to the Chinese Exclusion Act of 1882. That reaction and their subsequent written responses is the reason Black Lives Matter in Schools should be the rule, not the exception. Perhaps the most important realization is that all people benefitted from and continue to reap the rewards of movements spearheaded by Black Americans for equality and rights without realizing it. From modern labor movements in this country, to students being able to sit in the same classrooms, to students receiving free breakfast and lunch in schools. Black people fought, died, bled, and cried so that all of us can reap the benefits of our evolving system of rights. 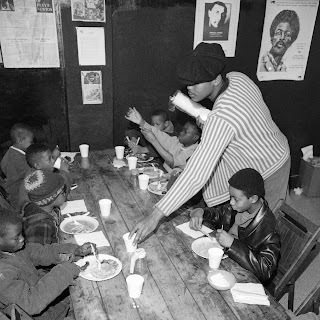 In a video from the History Channel shown to students yesterday for their Do Now, they learned about the Black Panther Party which began Free Breakfast programs in several cities throughout the United States to feed children in extreme poverty. 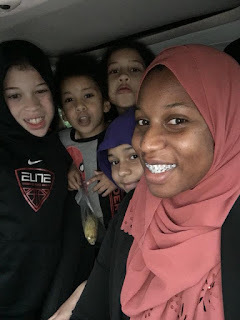 Two years after the start of the BPP's breakfast program, the federal government expanded their own program in the U.S. from only feeding students who traveled long distances to families who were working class or poor. It's not hard to see the connection between what the BPP did for children in poverty and the federal governments' hijacking of the program two years later. After the video, the students in some classes said in unison, "Thanks Black Panthers." I did not tell them to say those things. I did not tell them how to think. They recognized the importance of having access to free breakfast and lunch because many may not have a steady source of food in their own homes. As a teacher, my job is to give them the information, to be fair and balanced, to show representation of all cultures and races in my work and let the students develop their own thoughts on the things that matter. Unfortunately, in many classrooms, teachers aren't doing that at all. 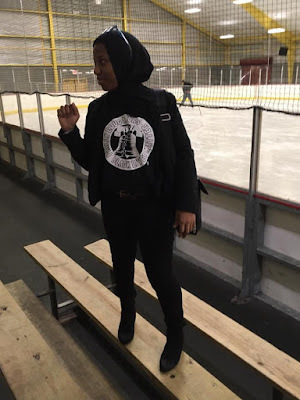 They give students one side, a Eurocentric approach, and students end up graduating school uneducated about our diverse history and ill-informed plus unable to tackle the social issues that plague our society today. Teaching like this causes division and keeps us trapped in the cycle of White Supremacy that ALL of us want to escape from. I could recount many stories about my students relating to the material, seeing themselves in history lessons and in my current Black History Month/Black Lives Matter in Schools lessons but I think you've got the point. As educators, we have a duty to uplift and restore the pride, history and culture of all of our students. It's time you started to do that today. If you truly believe that All Lives Matter, then Black Lives Matter in Schools should be a movement you can and should support. Special thank you to the Caucus of Working Educators of the Philadelphia Federation of Teachers for organizing the week after teachers in Seattle experienced "violent racism" in 2016 because they asked a group of Black men to come to the school and greet students as they walked in. Thanks to the hard work of WE, BLM in Schools week has now gone national and is prevalent in several cities across America including New York, New Jersey, Maryland, Seattle and beyond. To read more about the national movement, please click the link here to read more about events happening in Philadelphia for BLM in schools week, please click here! For more on Black History Events happening in Philadelphia, please read my blog post here more events coming later.